I interrupt your busy life to bring you this delicious, easy Bacon Cheeseburger Braid. Dinner in 30 minutes, you’re welcome! I forget sometimes that I work. The other day I was laying in bed. My husband’s alarm went off. Typical weekday morning at 6am. Only this morning it suddenly dawned on me. I have a job. I have deadlines. And contracts. And invoices. This little hobby of mine that I started almost 4 years ago…is a job now. Don’t get me wrong. I’m pretty sure my job is more awesome than most. Seriously, I can work in my pajamas. I drink coffee…for a living. I eat, bake, and repeat every day! I’ll be honest with you guys. I’ve done a few things wrong through the years. Early on, I would occasionally use products and share them with you…and not reveal that it was paid. Or that I received the products for free. I had no idea I was supposed to do that. I’ve learned since then. And here’s my promise to you. You will always know either at the beginning of a post or at the end (or both!) if a certain recipe is paid. That’s my pledge to you. But, in doing so, you will also know and should be comforted by the fact that I only work with brands I love and trust and use regardless of being paid. No joke peeps. So, where is this all coming from? Well, first from the realization the other morning that this blog is my job. And while I am passionate about creating delicious recipes, I also need to disclose to you that I don’t do it for free. The ads on my side bar, the affiliate links and the sponsored posts all help my family pay bills and enjoy life. (It also helps support this blog, because much of that money goes to hosting fees and other costs associated with food blogging). Second, I received an email about a month ago from someone who was upset that I was working with a certain brand (that shall not be named). And how I was “selling out.” So to revisit my second pledge…I only work with brands I love and trust. It may not be a brand YOU like. That’s okay. I don’t like lima beans, but I’m not going to send my favorite food blogger hate mail when she uses lima beans in a recipe. I’ll just skip along to the next one. If you have ANY questions about what I do, why I do it, how I do it, feel free to comment below or send me an email. In the meantime, enjoy my work! If you made it this far! Thank you! 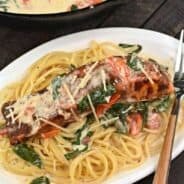 I’m pretty sure you are going to LOVE this dinner idea. I’ve been a bit obsessed with bacon cheeseburgers. So why not enjoy one that serves a crowd. It’s like one BIG cheeseburger. Just like I did with this Bacon Cheeseburger soup, I cooked my meat and added ketchup, mustard and pickles. You guys. Don’t frown your face. My condiment loving husband has NO idea I did this. Well, he does now. Sorry honey, but just remember…YOU LOVED THIS. Anyways, cook up your meat, add the condiments. Unroll a package of crescent rolls, pinching together the seams (it will be a long rectangle). 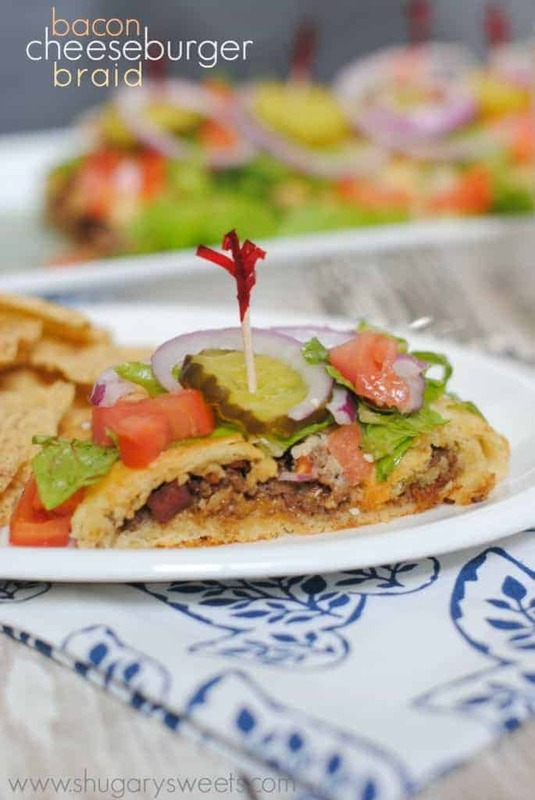 add your filling to the middle, along with the cheese and bacon. You can either fold up the sides. Or…cut one inch strips and twist the sides together over the top of the filling (like a braid). Sprinkle some sesame seeds on top (because yes…sesame seed buns are the best) and bake! 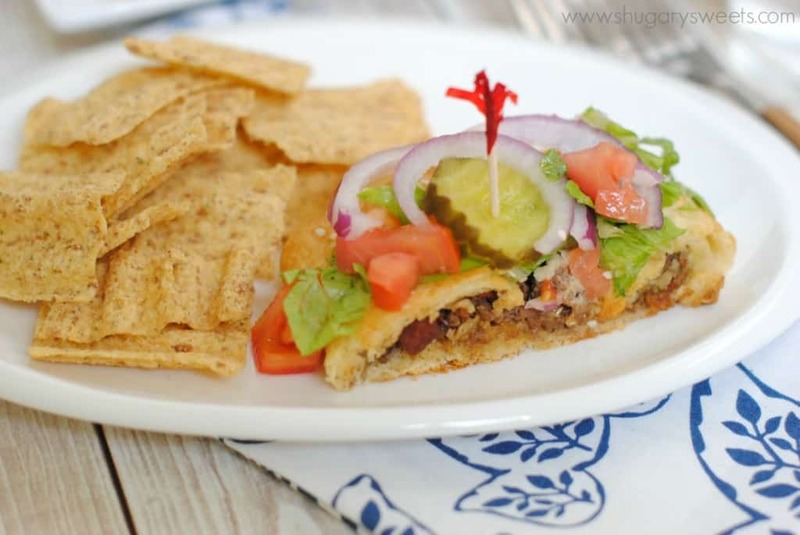 When ready to serve, add your lettuce, tomato, pickles and onions! ENJOY!! 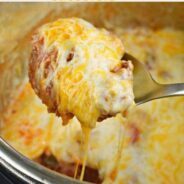 In a large skillet, cook ground beef. Drain fat. Add ketchup, mustard and diced pickles. On a large baking sheet, lay out crescent rolls into a rectangle, pinching seams together. Spread filling down middle of crescents...lengthwise. To close braid, cut one inch strips on sides of crescent. Pull up and twist over top. Sprinkle with sesame seeds. Bake in a 375 degree oven for about 20 minutes. 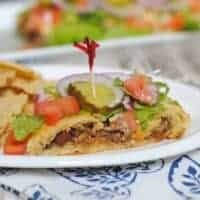 Remove from oven and top with lettuce, diced tomato, red onion and pickles. ENJOY! Love Bacon and Cheese? Well so do I! 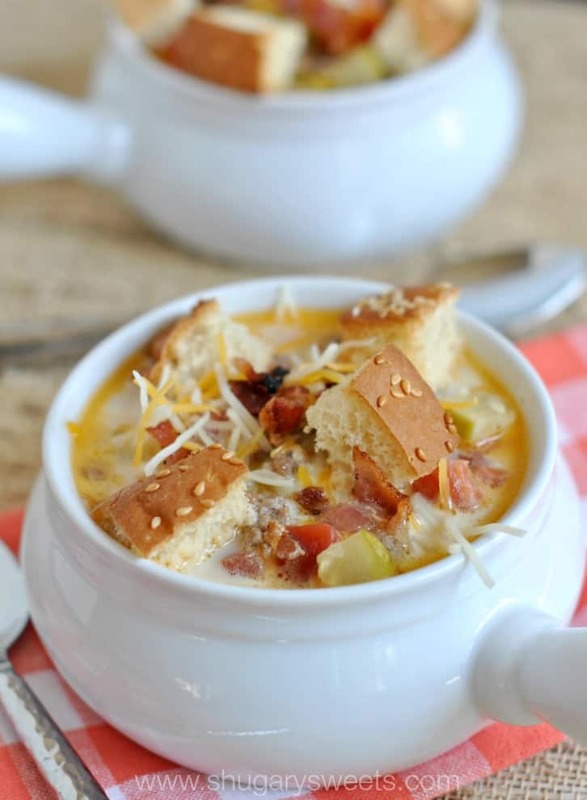 Bacon Cheeseburger Soup: it’s comfort food in a bowl! 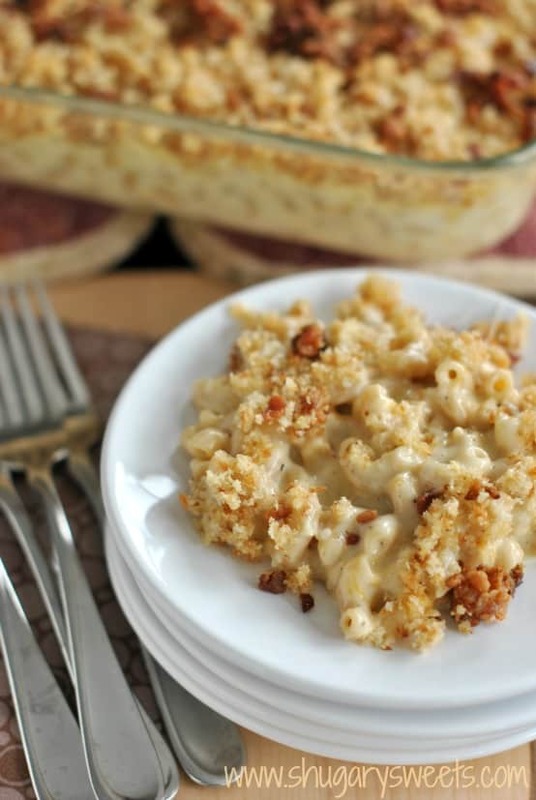 Gouda Bacon Mac and Cheese: seriously combines everything I love in one dish! 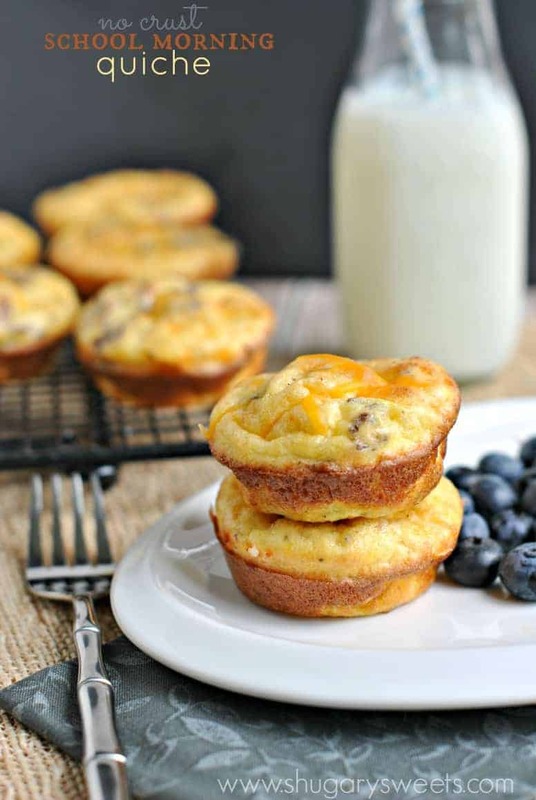 School morning quiche: make these bacon, egg and cheese muffins, freeze for later, and enjoy in minutes! I didn’t even notice it on your blog because you weave it in so well with the rest of your content! Thank you! And thank you for the sweet compliment! It’s amazing how a hobby can turn into a job. Every single day I wake up with a list as long as my arm to accomplish for the day. I totally respect your decision to work with sponsors (I do as well) because it costs a lot to run a site. This braid looks great too. How can you go wrong with bacon cheeseburger? 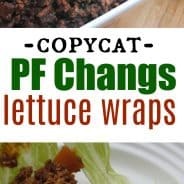 Aimee, this looks delicious and I can’t wait to try it! Blogging is a full time job and I don’t think people realize how much work it takes to post just one recipe. People can take and take but when they don’t like something they feel the need to say something. Why not be grateful and give a thank you Aimee for working so hard to create that amazing recipe right there. I can’t wait for the time when I can am doing sponsored post and working with brands I love. You are awesome and keep doing what you love, even in your pj’s and coffee in hand!! 🙂 Hugs! This is so creative, Aimee! 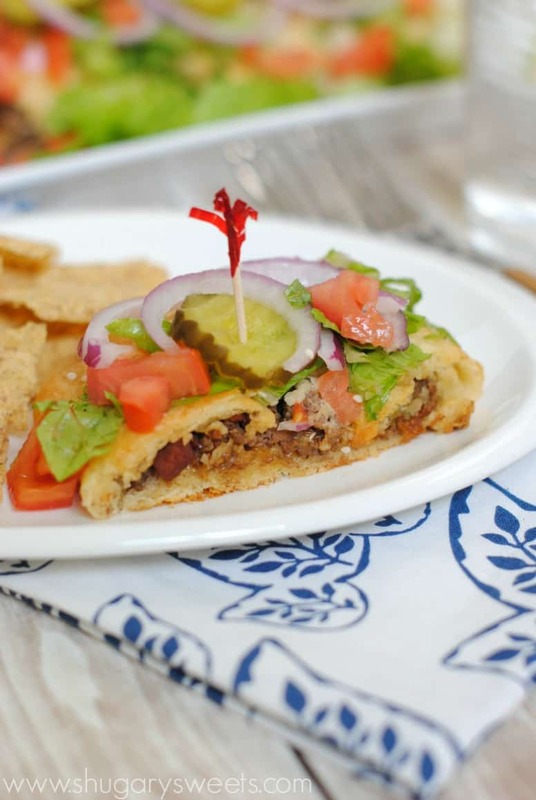 Great twist to a regular cheeseburger! It’s always amazing to me how food bloggers sometimes feel they need to “explain” the concept of doing it for a living. I have seen no other profession where we hear details of commissions, etc. and people justifying what they do. It makes me sad when people leave negative comments. No one but YOU knows how much work goes into it, and providing for your family is really what we all strive to do. I commend you for all your hard work, and as a fellow food blogger who hopes to some day support myself the same way, I appreciate your openness about the subject. P.S. My 15-year old son will probably eat this entire recipe all by himself…I better make two. Thanks! Yeah, I’m not sure why we need to explain ourselves! It seems like it wouldn’t take much to make a recipe and share it here on the blog…but it is work. Hours of writing, photo editing, social media. etc. You do an awesome job of weaving your sponsored work into posts, because it is truly authentic. When you are working with brands you love and use, it hardly seems like work, and that’s what makes it great! And this bacon cheeseburger braid? It needs to happen in my house soon! Haha! I have that same thought every morning now…time to “go” to work. Seems like so long ago when blogging was just an after thought, and now it is a full time gig. But I wouldn’t have it any other way…we seriously have the coolest, most awesome job! And someone really sent you an email about your brands? Little do they realize that we do only share the ones we love! You do a great job of weaving sponsored and non sponsored in your posts!!! Thanks for your candid post! I love what I do too, but I think I work harder at it than I very did at 9-5 job! The bacon cheeseburger braid looks delicious! What a fun recipe! This would be a great thing to take in a sack lunch too! Aimee, please don’t ever feel like you need to apologize – that’s the beginning of something you love becoming a grind. You give and share so much of yourself and I am forever grateful for your inspiration. At one point in my life had a small bakery, and was shocked at how many clueless people thought it was their right and duty to tell me how to run every aspect my shop. You keep doing what makes you you. and have fun – even if it includes a lima bean sponsor 🙂 (folks can always eat around them). You are a high point in my day and I always look forward to your candor and honesty.